Thank you all for the sweet comments you've left for me on my birthday. They've certainly put a huge smile on my face. The one thing that never fails to amaze me is the tight knit community we have within the blogosphere. I'm lucky to have met some of you. It's wonderful to have the kind camaraderie that we have going on here despite the fact that most of us are scattered all corners of the world. We're still in Nice on our sun fueled and eating fest vacation. I don't want to bombard you all with a million images of food, gelato, the beach and well, more food so here's something I've been dying to share since earlier this week. On my way to my favorite King's Road shopping trail last weekend, I did a short detour to Harvey Nicks. I managed to have a quick look at the new Autumn/Winter collection but the one brand that really appealed to me this time would have to be Whistles. Ever since I've been Isabelized (I borrowed the word from Myizzi), I haven't cheated on her once. Err.....with the exception of my one and only Rick Owens and Chanel jackets but that's understandable though. One sales assistant at Whistles told me that their Chief Executive, Jane Shepherdson drew her main inspiration from Celine. The new collection is incredibly well priced and the silhouette and colors are decidedly French. Call me crazy but I'm elated about the longer sleeves especially for those of us who are conscious about our bat wings. My upper arms are definitely my problem area and it's near impossible to find sleeves that aren't short or long and hit just above the elbow. As for her dresses, the fabric drapes just so to hide the bulge while maintaining a nice curve for those of us who don't have a pancake flat tummy. My main complaint with most designers and even mid priced brands these days is that they're charging more for less. More £££ but inferior quality. I'm still enamored with all things French particularly brands like Claudie Pierlot, Maje, Sandro, Comptoir des Cotonniers, The Kooples to name a few. I am not, however, in love with their pricing so I've taken to hunting around for similar styles but at a price range that I feel more comfortable with. Anyway, enough of my yabbering but check out their collection if you get a chance. I was just saying to a couple of other bloggers that Whistles is my current favourite shop - so many lovely things in store and all the things I tried on - fitted. Drat. That's when it becomes expensive. But yes, I recommend also to have a nosey in Whistles too. Dresses with sleeves - what's not to like especially for those wishing to hide the old bingo wings. Love your picks. We're always on the same wavelength. How scary is that?! I've never stopped to look at Whistles but I will from now onwards. Seriously impressed. Haha....yes, I can feel myself "blossoming" thanks to a boulangerie and chocolatier at every corner. I love it all! NIce pics! There are some really nice pieces in the collection! It's always nice to get something well made and that fits nicely for a reasonable price. Enjoy the rest of your lovely holiday and feel free to bombard us with some of your magical pic's! This collection really looks promising. I don't think we have Whistles here in Holland, but I should check them out online for sure. Enjoy the rest of your stay in Nice! Love your blog!!! Have to say though, having worked for Whistles, I can tell you the quality isn't that great either. Also I'm surprised you found a sales assistant to help you...just saying, not hating!? Thank you for the lovely compliment! Oh bummer. What's the comparison between Whistles with say, Zara? any difference in terms of quality? I've stopped by the little store on King's Road and you're right. I NEVER had a single SA who'd bothered to help. Too bad, the clothes are pretty impressive. Long time admirer of your blog and your style, first time commenter. I am in love with the Whilstles collection you posted here! Enough to consider ordering and shipping to US. 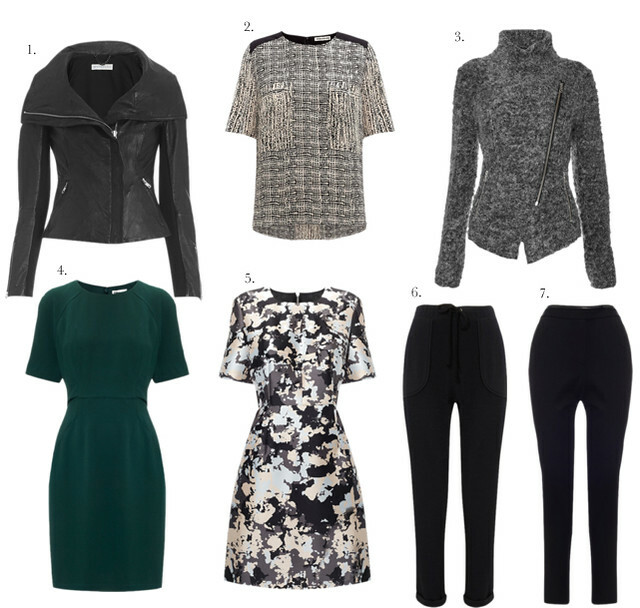 Have you tried on the Annabel Textured Jacket (#3)? Was curious if it had any stretch in the fabric. I adore the cut and texture but fear my straight (we have similar body types; reasonably slim but boyish and short) figure could wear something that nips in the waist without any "give" to the fabric. Hiya! Thank you for taking the time to write. I'm so pleased you like the blog. I wasn't able to find the Annabel jacket when I was at Harvey Nichols but then again they have a disappointingly small selection there. I had a look at the fabric content which is quite similar to an Isabel Marant jacket that I own. It has some stretch - a bit more like a cardigan and not a dense knit.